The adoption papers are filed & Tanner is officially ours! We are busy falling in love with this guy & he seems to be settling in more & more everyday. Proven by: Less panting, more sleeping. Slower food consumption....he was the gluttony poster child! So tonight we heard ripping fabric sounds...it was Tanner performing a squeeker-ectomy. After the clean up he quickly moved on to his next victim! Ha! 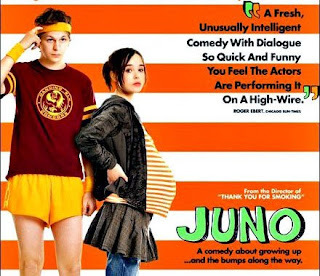 JUNO is a must see in my book. I loved this movie! i want a new job...have i mentioned that? oh yeah, i have, sorry. i will be covering the 'why' in another posting..
purging more items on ebay...love the purge! have had many smoky treat illusions/delusions lately. Watch the stress level...and stay away from those smokes! You have come to far to throw it all away now! Wow, M! We are so happy that you guys and Mr. T are SO happy together! We are thrilled to see each and every picture of that gorgeous guy. Keep on spoiling him, OK? He's an amazing pooch! I had a sick kid, a husband watching the NBA, and wicked storms, so I watched Juno on pay-per-view last night. It is a great movie - I so appreciate dry humor.